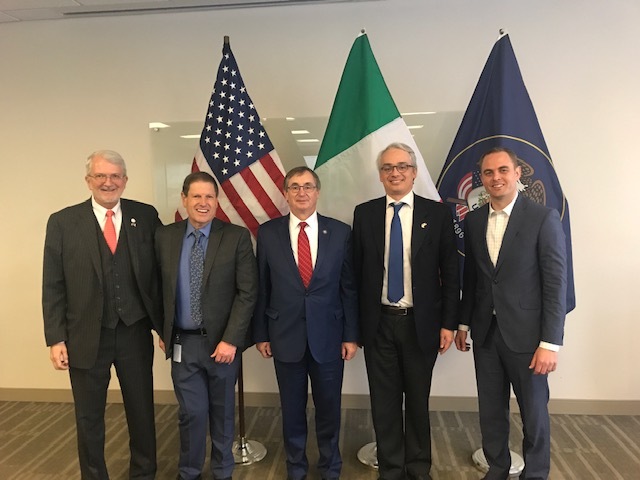 The Utah Governor’s Office of Economic Development and World Trade Center Utah recently welcomed dignitaries from Italy. The Honorable Lorenzo Ortona, Consul General from the ltalian Consulate in San Francisco and the Honorable Mike Homer, Honorary Consul for Italy in Utah met with Governor Gary R. Herbert in the Gold Room of the Capitol Building. The meeting was followed by a roundtable discussion with Utah government and business leaders along with Mr. Luigi Biondi, Deputy Consul at the Consulate General of Italy in San Francisco. Participants discussed current economic, educational and political topics focusing on life science, information technology, aerospace and financial services. Italy is a leader in these industries. Italy is one of the largest and most important economies in Europe. Italy has a very strong aerospace industry. The 2002 Winter Olympics were held in Salt Lake City followed by the 2006 Winter Olympics in Torino, resulting in a sister city relationship between the two cities. Consul General Lorenzo Ortona expressed admiration for Utah’s economic accomplishments, and how Utah has led the way in internationalizing its economy. He mentioned one of Italy’s energy giants, Enel Green Power, has made significant investments in Utah. Ortona is thrilled about the upcoming Utah trade mission to Europe this summer, which will include Rome and continue to foster opportunities for collaboration. “Over many decades, Italy has been a very important trading partner with Utah. We are extremely grateful for the many economic, educational and business relationships we have with Italy. We would like to thank the government of Italy for appointing Michael Homer as an Honorary Consul in Utah. For many years, Mr. Homer has built important bridges between Utah and Italy, ” says Franz Kolb, GOED’s director of International Trade and Diplomacy. For more information, contact Franz Kolb, Director of International Trade and Diplomacy in the Utah Governor’s Office of Economic Development at fkolb@utah.gov. Or for more information on Italy, contact Mike Homer, Honorary Consul for Italy in Utah at italianconsul@sautah.com.